Another type of wrestling game flourishing at the time of Capoeiragem was called Pernada, Batuque boi or Samba duro; we collectively call these games leg-wrestling. The principle was always the same: one player standing firm with his feet together and the other dancing and tricking around him, trying to throw him down in the opportune moment by a leg swipe (banda). The game was often accompanied by music. Pernada was very close in aim and principle to Capoeiragem, to the extend that most techniques of Pernada can be applied in the fight of Capoeiragem. Capoeiras always used some of the Pernada throws (bandas) in fights. Suddenly one of the fighters enlaces with his right arm unexpectedly both arms and chest of the other, and with the speed of a ray, of lightning, joins with him flank against flank; then blocks and sweeps his legs out and high up, throwing him backwards,leaving him on the ground cold and motionless as a corpse." You don't have to be an expert on capoeiragem history to see that one capoeira slammed the other on the ground with a throw-a banda. In my qualified opinion, what is described is probably de lado. 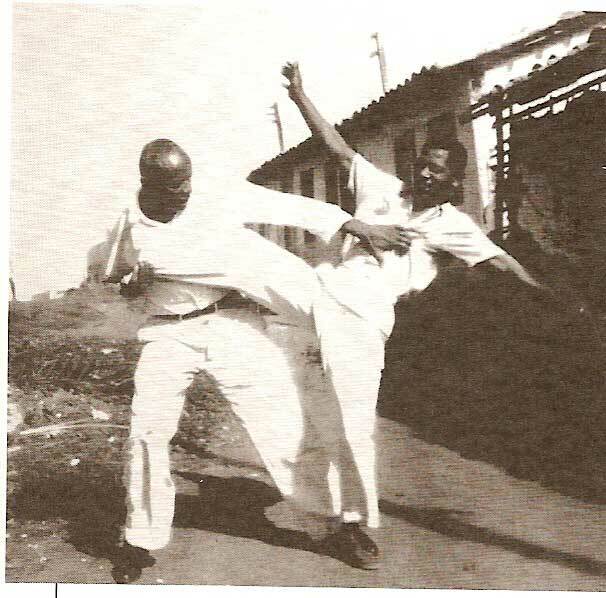 Similarly, Mestre Bimba incorporated certain throws from 'Batuque' into his original Regional style (in his booklet from the 60's "Curso de Capoeira Regional", you can see banda da costas, banda de lado,cruz and banda tracada). However, these techniques are either not done today or messed up to obscurity. "Espondeu-me que se valeu de golpes de Batuque, como Banda armada, Banda fechada, Encruzilhada, Rapa, Cruz de carreira e Baú." As a part of our study of Capoeiragem, we managed to rescue (recreate) some of the probably most popular 'bandas' or leg-wrestling throws of the time, heavily used both in Capoeiragem and in Batuque/Pernada/Samba duro. We use them both in Capoeiragem bouts and by themselves, as a training exercise, similar to old Batuque. 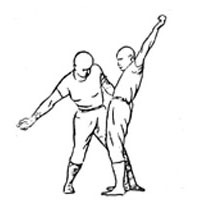 Note that all of these techniques are throws; ie.the opponent is unballanced and slammed on the ground. None of them entail 'kicking opponent in the legs' etc. Most of leg-wrestling throws are done standing; but some have ground variations (done on all fours). A few can only be done on the ground. We formally classify rasteiras as a part of leg-wrestling, even though tactically, they belong more to capoeiragem. (Note from 2019: The list is a bit different today; see the new article on Batuque. Also, rasteiras are not part of Batuque, as they cannot be done against both legs; they belong to capoeiragem).